Deputy Mayor Sheldon Forgette says he'd like to see disabled ramps at a pair of city beaches by next summer. The ramps would extend to the water edge says Forgette. "The motion I have with the clerk is to have a report come back to council to tell us if it is feasible to do it and what it would cost and look like," he told BayToday. "The province has a goal to be fully accessible by 2025 so I think this would fall in line with that goal and I think it would be great to make our city accessible that way." Forgette expects each ramp to cost around $25,000. Forgette's motion doesn't have a seconder, but he doesn't expect that will be a problem. His motion reads. "Whereas the City of North Bay believes in being an accessible community and; Whereas City Council believes that a citizen with a wheel chair should be able to access the sandy beach and water at our beautiful waterfront. 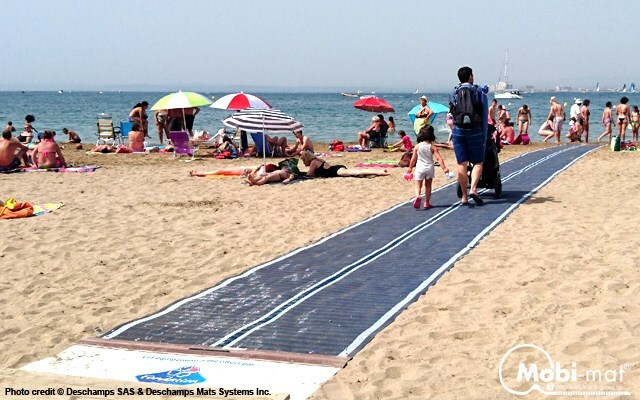 "City Council would like a report from staff, detailing the cost and deployment of a beach platform that will allow for anyone with a disability to experience North Bay's beautiful beach waterfront." City Council would require this report with a recommendation no later than April 2016, says Forgette. "I'd like to see this installed by the summer of 2016." Virginia Beach offers the use of two all-terrain wheelchairs at the oceanfront free of charge. See a disabled ramp in use on this YouTube video. See Bay Today article . . .